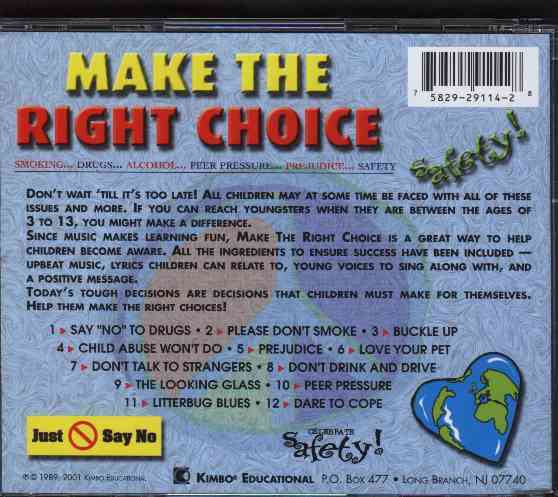 Help your kids "MAKE THE RIGHT CHOICE"! Kids Character Build with upbeat songs and learn while having fun! 12 Song Collection Produced by Kimbo Educational, Long Branch, New Jersey with all "Live Band" instruments. 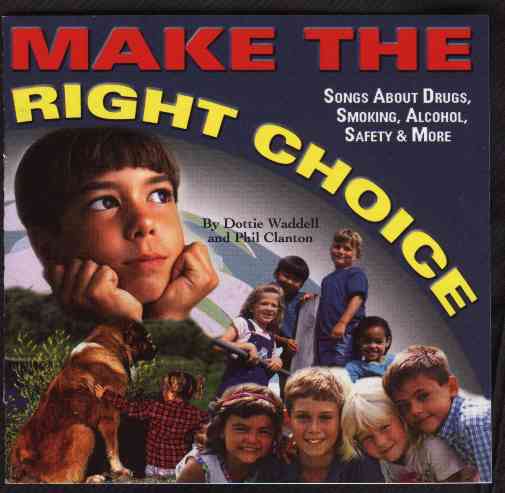 All Songs Composed by Dottie Waddell and Phil Clanton who authored "Don't Talk to Strangers" and co-authored "Prejudice". 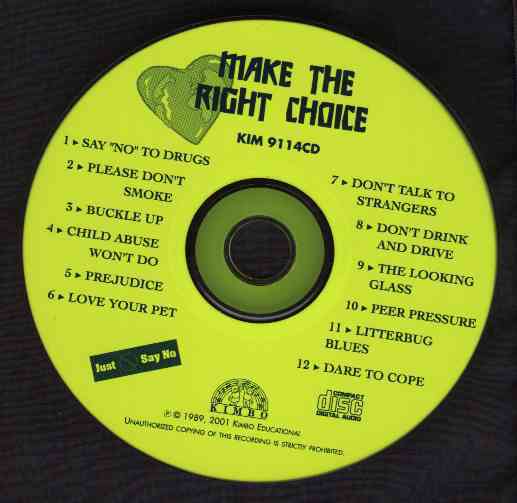 Sound Clips (MP3's) of "Make the Right Choice" below. Instead give a friend a hug. It'll make you feel good all day. With drugs, you throw your life away. Smoking makes your heart die. Instead give love as a rule. That problems have a way of working out. That it's what's inside someone that really counts. that everyone needs a fair chance. Feed them and bathe them too? Love comes back twice fold. Our lives are gifts, oh, so real. Help us children stay alive. We're asking, please, don't drink and drive. When the love's strong by your side. When I take off my mask I can see. And out pours the love inside of me. But sometimes a gang may be bad for you. And helps to build your confidence. Take another minute or two. They're just sitting there waiting for you. ...To get rid of those litterbug blues. Dare to cope, you're special.